Free gourmet cookie for the Mayor! Choose between old fashioned chocolate chip, oatmeal raisin, snickerdoodle or peanut butter. YUM! Free Giant Bavarian Pretzel for the Mayor! Show that you’re the Mayor of Carrabba’s and enjoy a complimentary dessert with the purchase of an entrée. Grazie! Get a free monogram cut mat for your first check in on Foursquare! Hey hey! Show that you’re the Mayor of Garnett’s Cafe and get a coffee, on us! Ipanema Cafe – 917 W Grace St.
btw Harrison St. & Shafer St.
Hey hey! Check-in and show that you’re the Mayor of Ipanema Cafe and get an order of sweet potato fries, on us! Fifty cents off all coffee bar drinks once a day when you check-in. Mayor receives free coffee bar drink! Two free IMAX tickets for the Mayor! Free PoPcorn & 1/2 Off Appetizer on your 1st Check-In! 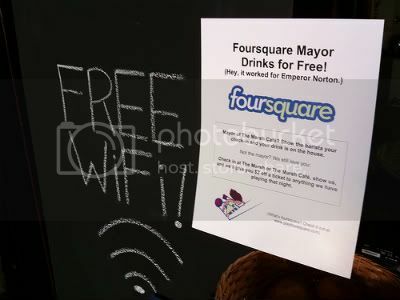 Become our Mayor and get a free drink or Appetizer on us! Are you the mayor of Togogo? Show us and get a free order of Sticky or Garden Balls with your order! Show us you’ve checked in 5 times and get a free side of our delicious Tots! Woo Hoo! Free 10″ Specialty Pizza for the mayor!